transmissions. 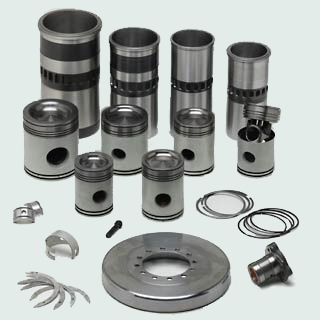 We offer an extensive package of parts for diesel engines such as: MTU, Detroit Diesel, Cummins, Mercedes Benz, Caterpillar, MAN, Perkins, Deutz, Volvo Penta, ZF and Allison. Also we supply new, remanufactured and used diesel engines and transmissions such as Detroit Diesel, Mercedes Benz, Allison, etc. Power Parts Supply has over fifteen years of experience in handling and selling high quality parts. Excellent contacts with manufacturers, distributors and importers, an extensive product knowledge and our commitment to quality and service has made us an attractive and reliable partner for foreign governments, original equipment manufacturers, revision and repair shops, intermediaries and end-users. The success of our company is based on making business efficient for customers. We have fast access to many thousands of different parts and components. Most parts can be delivered from our own stock against very competitive prices. However, it's our attention to service that sets us apart. Real service means more than a fast delivery of parts. It often means providing solutions to additional technical problems. For instance: we can advice our customers which part would be the most suitable for a specific engine or for a special application; we take care of technical schemes, additional information as to where and how the part should be installed. Power Parts Supply handles these activities not only for clients in the Netherlands but for governments, original equipment manufacturers and intermediaries throughout the world, all know and appreciate our comprehensive range of parts and excellent logistic support services.